The Cheese and Wine Shop of Wellington - Learn about Cheese Wedding Cakes here! 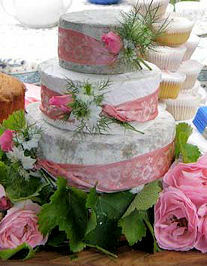 Learn about Cheese Wedding Cakes here! The Cheese and Wine Shop has created a range of tiered cheese 'cakes', which are perfect for a wedding or celebration with a difference. Click here to view our range of Celebration Cheese Cakes. We have an extensive range, but can make a cake to your budget and brief. The Cake can be decorated by you, your florist or caterer to complement your occassion; bridal flowers, or dressed with whatever fruit is in season: figs and grapes in Spring, strawberries and cherries in Summer, nuts and plums in Autumn and Winter. Our cheese cakes also make a wonderful centre-piece for an anniversary, christening or special birthday. WHAT IS A CHEESE CAKE? It’s not a cheesecake, or not the one most people think of. Its definitely not a dessert! Rather, its made up of several cheeses, arranged one above the other in the same way that the tiers of a traditional wedding cake are arranged. The Cheese and Wine Shops celebration cakes are made entirely of the finest quality cheese and then decorated with fresh fruits and flowers to stand as magnificent centrepieces, rivalling any traditional iced fruitcake. Our cheese celebration cakes can be created to your design, in that you choose the number of tiers and decide how you want your cake dressed. Whether its a Celtic wedding, a Lancashire knees-up or a welcome party for Antipodean cousins, we can help you select cheeses from our worldwide cheese menu that will add the right flavour to your celebration, and co-ordinate perfectly with any colour scheme you may have chosen. In terms of cost our cakes work out at roughly £2.00 to £3.00 per head; very reasonable when compared to an iced cake or a chocolate cake. We can deliver nationwide, with our cheese celebration cake prices starting from just £95, plus delivery. We have a wide range of combinations that work, which make choosing your cake very easy. Please click here to view. Please be aware that we will supply the cheese along with instructions and recommendations on how to store it between arrival and the big day but you will need to ask your florist or caterer to decorate it for you. You can use our photos for inspiration or get your florist to come up with something that echoes the bouquet or table decorations. A mixture of flowers, herbs and fruit can look stunning. You should also be aware that as the tiers get smaller there will be less cheese! If you want equal amounts of cheese you will need to order more of the top tiers. We can also deliver a delicious range of biscuits, pickles or fruits for cheese to complement your cheese selection. We can deliver to the wedding venue (anywhere within the UK mainland), via courier, a few days before the wedding day. Some people simply do not like traditional wedding or celebration cakes..... or for that matter any fruit, chocolate, profiterole, marzipan or cupcake based cake! As such, a Cheese and Wine Shop Cheese cake is the perfect solution! Our cakes are suitable for anyone who would prefer a savoury cake with stunning visual impact, or who would like a cheese course, with added impact at their wedding or celebration event. Please check with the venue and or caterers that they are happy for us to supply the cheese course. Please do check that they will be able to sign for it on your behalf, and that they will have sufficient refridgeration and storage facility. We normally recommend 110g of cheese per person (or around 4oz) which means in theory, that if you have 100 guests you will need a 11kg cake and so on! Some guests will not eat any cheese (14.2% of people do not eat cheese) but other guests will eat much more than 100g so from our experience of providing cheeseboards for functions, allowing 110g per person will cover it adequately. Forty guests is about the minimum sized cake so if you have fewer than that we would suggest a nice selection of cheeses. Some Cheese and Wine Shop customers have bought cakes twice the size they need simply to create the right impact; they then use the remaining cheese for another cheese meal. Remember that most blue cheeses freeze although we don’t recommend this; far better to enjoy any surplus within the few days after your event. You may need slightly less than 100g per person if the cheese celebration cake makes up part of a buffet, or if its in addition to a traditional cake. The first is the easier and most popular way and is known as ‘the American style’. The cheeses are simply stacked on each other, with a circle of greaseproof between each. The second involves separating the cheeses with stands, boards, pillars, etc. Whilst talking of adding other items to your order, many customers have also added some chutneys and pickles to go with their cheese selections. DOES THE CAKE NEED DECORATING? Once assembled, you may want to decorate the cake according to your events theme, or perhaps you would prefer to find someone artistic to garnish it in an attractive manner! We do not provide fruit or other garnishes as everyone has their own personal ideas. Cherry tomatoes, Fresh Grapes, flowers, and even some figurines all seem to work well, along with decorative ivy and fruits such as strawberries, figs, passion fruit and kiwi fruit. If you are worried about cut flower or leaf stems touching the cheese, wrap the stems in a little clingfilm or foil. We think that the cakes work best when they have all their wrappings removed before decoration, although some people do like to see these! CAN I BUY A CHEESE WEDDING CAKE AT ANY TIME OF THE YEAR? Yes. That was easy wasnt it! Christmas is a very busy time, so if your event is occuring during the festive period, please factor this into your planning. Ideally, a minimum of 1 month, although we can normally supply a celebration cake from our standard selection with 1 weeks notice. HOW IS MY CHEESECAKE DELIVERED? We use Parcelforce next day service before Noon delivery. Someone will need to be in to sign for it, unless you tell us to leave it in a secure location on site. If you are able to plan a visit to the West Country, then why not organise a shop visit? We can introduce you to the Cheeses, and you can taste the selection, which is to be recommended! Please call us on 01823 662899 or send us an email and we can contact you to confirm an appointment time. Its easy; order online, click here to make your selection. If you would prefer, please call us on 01823 662899 and we can take your order, or discuss any specific requirements. You can cancel your order one month before despatch at no charge and we will credit your £25 deposit back to your credit card. There will be a £25 charge (in effect your deposit becomes non-refundable) for a cancellation at shorter notice. If you need to e-mail us, one way you can assist us is by continuing a thread of e-mail (i.e. keep replying to our e-mails rather than creating a new one each time). This way we have all your e-mail correspondence on one e-mail rather than on, sometimes, many. We have hundreds of enquiries a year and this is the best way for us to keep track of all customers. During December we are frantically busy. Please try not to e-mail during the run up to Christmas unless your wedding query is really urgent. As mentioned above, we need to work with round cheeses, which precludes us from suggesting cheeses which come in a wedge shape these are generally very large cheeses such as Lancashire, Cheshire, Vintage Poacher, etc, which have to be quartered and therefore end up in our shop as a broad wedge. We never recommend fruit flavoured cheeses as these wet cheeses leak fluid on the wedding day as they warm up and will spoil the look of the cake. We can work with large cheeses if they can be split into halves or thirds. Please click here to see our list of Cheeses that we use to make our Celebration cakes. This list makes it easy to choose your own selection, or if you would like to change one of our standard designs. If you have any further questions, please contact us on 01823 662899 or send an email, and we will do our very best to help.